When Pat Rothfuss does something, he goes all out. His debut novel, The Name of the Wind, is over 600 pages long. The sequel to this novel, The Wise Man's Fear, debuted at the top of the New York Times Bestseller list. And since its start in 2008, Pat's non-profit organization--Worldbuilders--has raised over half a million dollars for Heifer International. That's right. Half. A. Million. Dollars. While this is extremely cool in and of itself, that's not all. 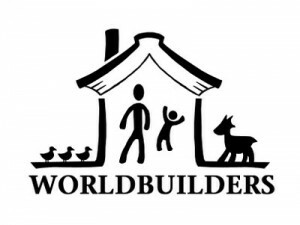 From now until January 31, Worldbuilders is running a campaign where it will match 50% of all donations AND for every $10 you donate, your name gets entered into a drawing for all sorts of amazing prizes. What sorts of amazing prizes, you ask? Signed books by your favorite scifi/fantasy authors. Advanced reader copies of things not yet released. The complete series of Buffy on DVD. Hats like the one Jayne wore on Firefly. And if you don't like anything that you see (which is very unlikely), stick around, since new prizes get posted all the time. A complete list of this year's prizes can be found here. And since you donate directly to Heifer International (through Worldbuilders team page), you know that all of your money is going directly to the charity itself. The link for donation is here. More questions? Here's the FAQ. A $20 donation will purchase a flock of chicks. So far, over $140,000 has been raised this year. That's a lot of chicks.